Author: Alejandro Rabinstein, M.D. Professor of Neurology. Mayo Clinic. 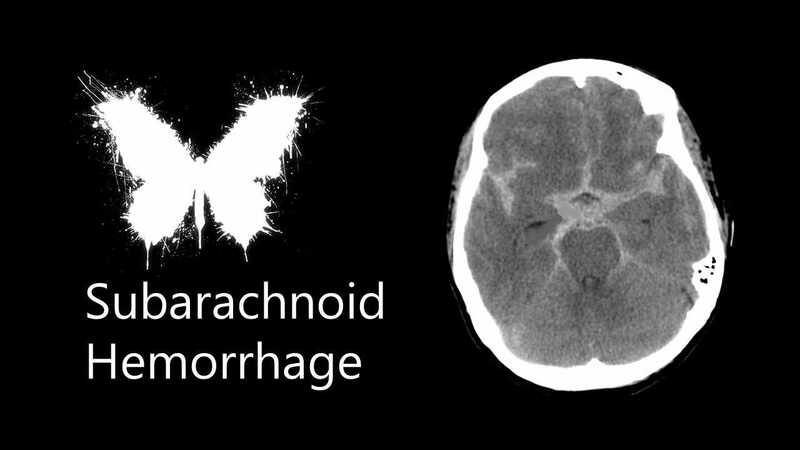 Diagnosis of subarachnoid hemorrhage (SAH) is a big topic in the ED and one that is often discussed. However, it is also crucial to know what to do once you diagnose a case of SAH. Here I will be discussing exclusively the early evaluation and management of cases of non-traumatic SAH of presumed aneurysmal source. More detailed information can be found in a review that reflects our practices at Mayo Clinic (1). 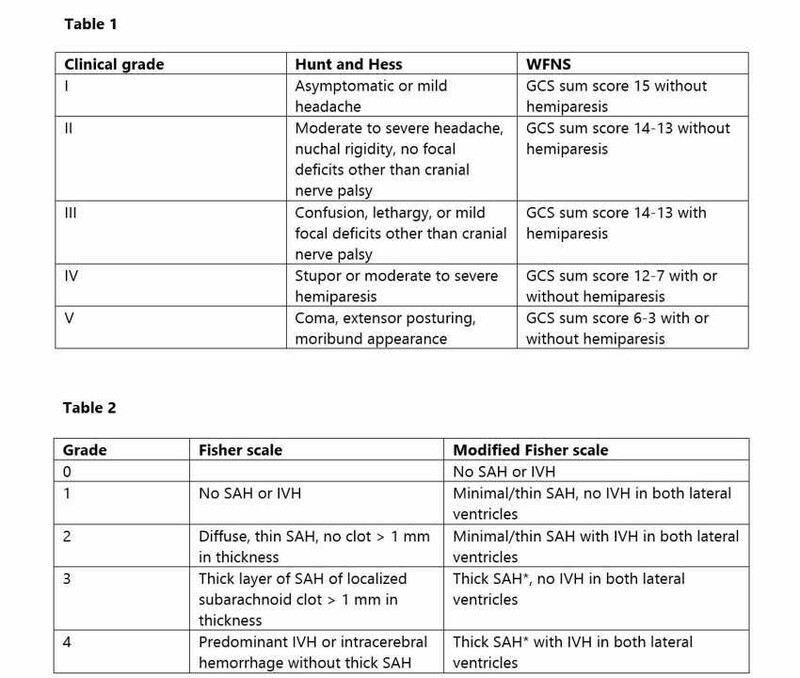 Early clinical evaluation of a patient with SAH should include a focused neurological examination including level and content of consciousness and presence of cranial nerve abnormalities or focal motor deficits. Those simple elements will allow you to come up with the patient’s clinical grade. 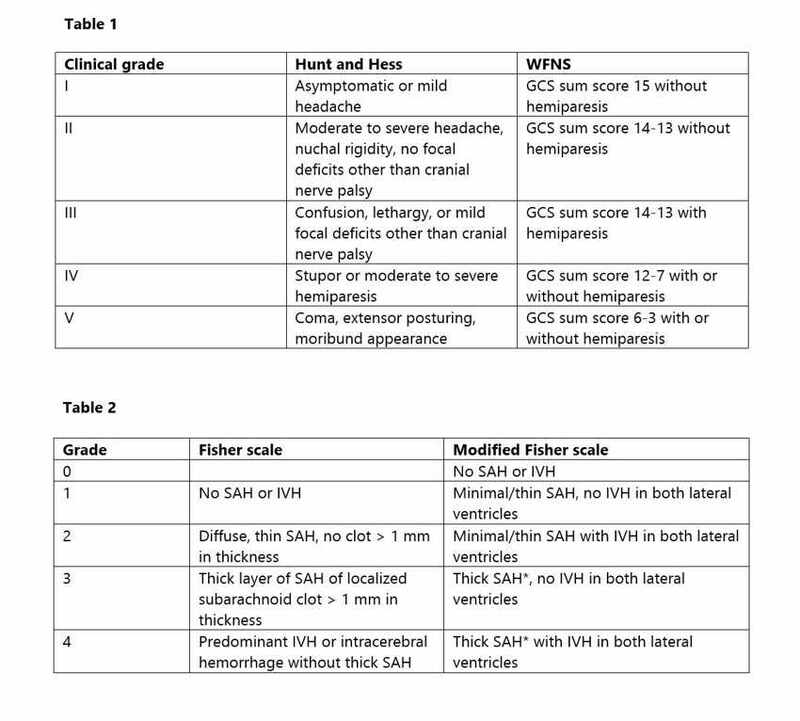 There are two commonly used scales, WNFS and Hunt and Hess (table 1), and they are both proven to predict the patient’s functional outcome and are certainly useful to know how complicated the acute clinical course will be. I prefer the WFNS because of its simplicity (essentially the GCS and presence or absence of hemiparesis) and lack of dependence on subjective information (such as severity of the headache). The amount of blood in the early CT scan should also be quantified as it is a predictor of subsequent risk of vasospasm. Close attention should also be paid to the vital signs and cardiopulmonary status. Airway, breathing and circulation can all be affected. Patients with severe SAH can have hypertension from the sympathetic surge or related to the response to global cerebral edema. Hypotension can be seen in patients with stress-induced cardiomyopathy (most frequently presenting as apical ballooning syndrome). Bradycardia can be encountered if hydrocephalus is present. Central fever is common in SAH patients, but not at presentation. Therefore, if fever is present in the ED, you should exclude infection (most commonly aspiration pneumonia). Poor oxygenation can result from cardiogenic pulmonary edema, neurogenic pulmonary edema or both. Stuporous or comatose patients can also develop atelectasis and aspiration. Administration of an antifibrinolytic agent: This is an intervention supported by randomized controlled trial data (2). Either tranexamic acid or aminocaproic acid can be used. We typically use tranexamic acid 1 g IV every 6 hours until the aneurysm is secured or for up to 72 hours. The first dose should be given ASAP after diagnosis. Blood pressure reduction: Current guidelines recommend gradual BP reduction below a systolic of 160 mmHg (3,4). This is based on indirect evidence from observational studies showing that patients with higher SBP had greater incidence of aneurysm rebleeding. It is prudent to be cautious to avoid sudden and profound BP drops, particularly in poor grade patients with global brain edema who may have compromised cerebral perfusion. Labetalol or nicardipine are good drugs to use. Nimodipine is used in aneurysmal SAH because trials have demonstrated a reduction in the risk of delayed cerebral ischemia associated with its administration; however, this medication requires enteral access and is typically started once the patient is already in the ICU. Hydrocephalus: often a “quiet” emergency. The patient drifts into coma and may develop bradycardia and a lower degree of hypertension. Examination may show downward gaze deviation. The patient appears comfortable but the situation needs immediate attention. You should repeat brain imaging and contact Neurosurgery. Patients with neurocardiogenic injury can have overt changes in the EKG (predominantly repolarization changes, sometimes with diffusely and profoundly inverted T waves throughout the precordial leads – often referred to as “cerebral T waves” – and prolongation of the QTc interval). ST elevation can be seen in patients with stress-induced cardiomyopathy but they typically are not restricted to a coronary territory. Troponin elevations can also be present, though markedly rising levels on serial measurements are less common. Be aware that a concomitant myocardial infarction in a patient presenting with aneurysmal SAH is a rarity, while stress-induced cardiomyopathy mimicking a coronary event is relatively common. So analyze the situation and discuss with the neurointensivist before contacting Cardiology as this is not necessary in most cases. If the patient is hypotensive, a vasopressor with inotropic action such as norepinephrine is preferred. Emergency echocardiogram is useful to clarify the cause. If there is evidence of apical ballooning and the blood pressure can tolerate it, starting a low dose of a beta blocker is reasonable. If there is clinical and radiological evidence of pulmonary edema, positive pressure ventilation is very useful to correct the neurogenic component (as well as the cardiogenic), but diuresis may be necessary in some cases (mannitol is an option to furosemide in poor grade patients with brain edema). If there is suspicion of aspiration, start antibiotics. Fever can be either infectious or central (see above). Remember that leukocytosis in patients with severe acute brain insults does not mean infection. And never forget NOT to use hypotonic fluids (including lactated Ringer) in patients with cerebral edema. All patients with SAH should be evaluated by Neurology and Neurosurgery if available locally. If not, they should be transferred ASAP to a facility with these services. Furthermore, all patients with SAH of presumed aneurysmal source should be admitted to a dedicated Neurocritical Care unit with specialized nurses and a neurointensive care team. Higher patient volumes and dedicated neurocritical care have been shown to improve outcomes in aneurysmal SAH.